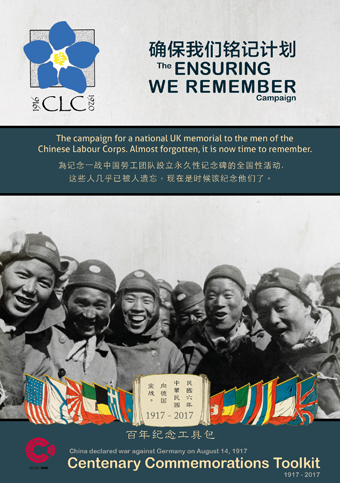 The Ensuring We Remember Campaign if spearheaded by a coalition of major UK Chinese non-profit organisations. To mark today’s centennial anniversary of China declaring war on Germany we reflect on the position of the Chinese community in the UK, whilst launching our Centenary Commemorations Toolkit. Today the Chinese community holds a privileged position in the UK. Through the hard work of those Chinese who came after the second World War, Chinese communities in Britain are strong and vibrant. Although no country is perfect, and no people are without faults, Britain and the British people have overwhelmingly welcomed and accepted Chinese people. For their part, the Chinese have worked hard and hindered nobody, through which they have built, and maintain, strong economic and cultural capital. Chinese children have for decades outperformed children from all other ethnic groups at both GCSE and A’Level, fulfilling the dream of every parent that their children’s lives should be better than their own. But it is not only duty to family that concerned the Chinese in Britain – we would argue that they have also contributed to a better society. The Chinese are the only ethnic minority group that is under-represented in the British criminal justice system, something for which the Chinese community can justly be proud. Less obvious is the pride that might be held in the fact that in both World Wars the Chinese and British peoples stood united against common enemies and ideologies. For this reason we are today encouraging Britain’s Chinese communities and supporters to commemorate this much neglected are of our heritage – a century to the day when China formally declared war against Germany and joined Britain and her allies in World War I. To this end we created a Centenary Commemorations Toolkit which has already been sent out to British Chinese religious, voluntary and community organisations. We will be working with Chinese supplementary schools in rolling out the toolkit. We hope, by promoting a growing awareness of the full contribution of Chinese people in British history, we can contribute to the ongoing development of a fully integrated, high performing, socially cohesive British Chinese community. « China Declared War Against Germany 100 Years Ago Today.